We’re in between the color and the cold right now. But no frost yet. 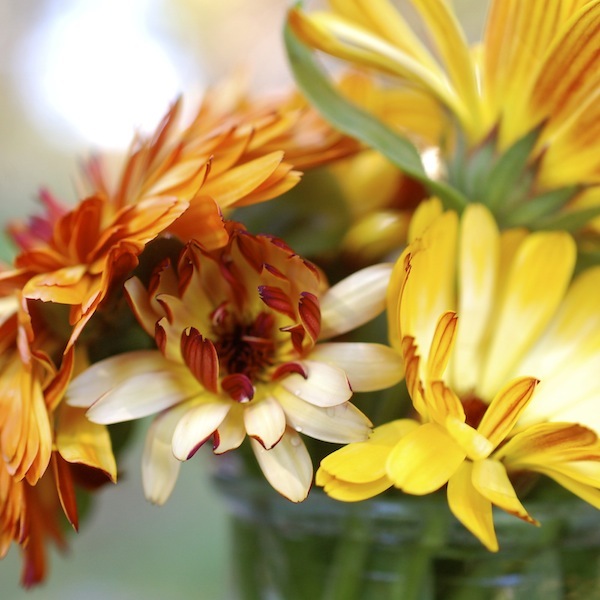 So we still have flowers. Round two or three or four on the self-seeding calendulas. And we still have green beans. Yay. 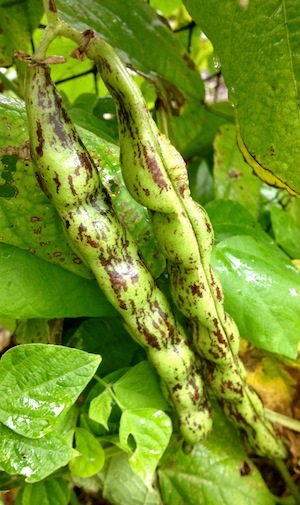 Rattlesnake pole beans. Double yay. Lucky we are that the trellis hasn’t blown over in this Nor ‘Easter whiffling past. But even if it had, I’d be out there picking through the vines on the ground. I can’t pick every day now, though, because the plants are flowering less and yielding less beans. It’s not efficient to spend time going up and down the row, squatting up and down to check every vine, if you’re not going to come away with much. So when I do pick, some of the beans tend to be on the larger side. If they are really getting fat, I leave them, because the Rattlesnakes will eventually yield edible seeds. 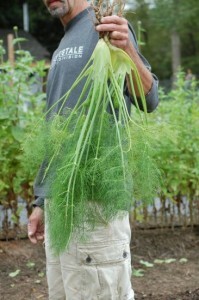 Some of them (see photo at right) are already plump and podding. But if they are just a little bit beyond the filet-ish stage, I have my excuse for a slow-sauté. Every year I talk about slow-sautéed green beans on Sixburnersue. (Sorry.) I love the technique because it brings out the nutty, earthy, satisfying side of green beans, while adding the delicious side notes of aromatic veggies and herbs that cook in the pan, too. And though it certainly isn’t required, a bit of bacon, ham, or pancetta in the pan never hurts. Last night I made a vegetarian version of one of these sautés with the Rattlesnakes, some shisito peppers, and shallots, and served it over polenta. But because my good camera is malfunctioning (it needs to be cleaned, but my car is also malfunctioning so getting to the camera shop is going to be tricky! ), I don’t have a nice photo of the dish to show you. 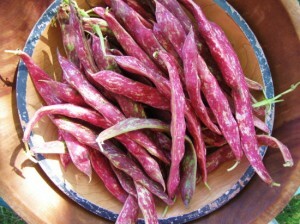 It is probably just as well, because while these beans are delicious, they aren’t the prettiest. 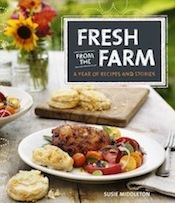 Of course, because I love the technique so much, I had to include it in Fresh from the Farm: A Year of Recipes and Stories. 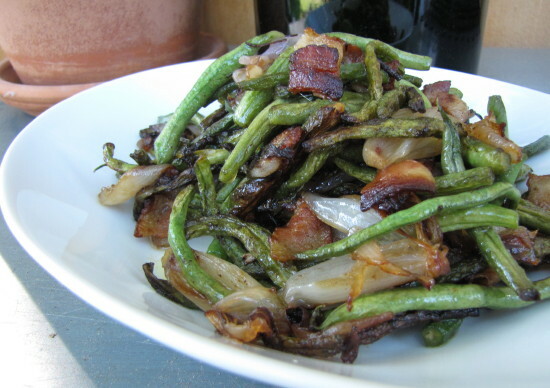 So I thought I’d share that recipe (Slow Sauteed Green Beans with Shiitakes and Prosciutto) with you here, even though when I wrote it we were growing Kentucky Wonder and Fortex pole green beans, not Rattlesnakes. Now that I’ve discovered Rattlesnakes, there’s no going back. But any green bean (pole or bush), as long as it isn’t too thin, will work here. Get out your skillet and go for it. 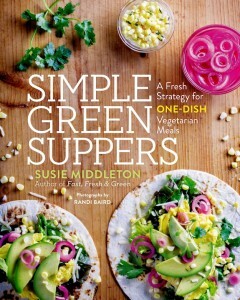 Recipe copyright Susie Middleton from Fresh From the Farm: A Year of Recipes and Stories. 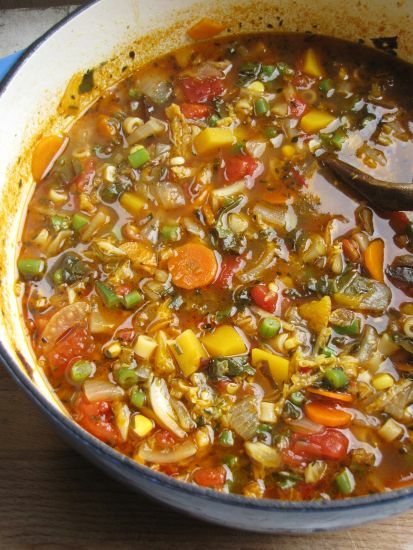 You won’t believe how crowded the pan is when you first load it up with all these veggies; but with this terrific (and straightforward) technique, the veggies will slowly soften, brown, and shrink into a delicious and tender tangle of deep flavor. The browning will start happening fast in the second half of cooking, but don’t jump the gun and stop the cooking too soon. Just stir more frequently and really let everything get a deep brown color for the most lovely flavor. In a small bowl, combine the maple syrup and vinegar. In a large (12-inch) nonstick skillet, heat the olive oil over medium heat. Add the beans, mushrooms, garlic, prosciutto, rosemary, and 1 teaspoon salt. Toss well with tongs to coat. Cover the pan and cook, stirring occasionally, until all the green beans have turned bright green, are beginning to turn brown, and have begun to lose their stiffness, 10 to 12 minutes. Uncover and cook, stirring more frequently, until all the beans are very deeply browned (the mushrooms and garlic will be browned and tender, too), 15 to 17 more minutes. Remove the pan from the heat and taste a bean and a mushroom for salt. Season lightly if necessary (the mushrooms may have absorbed more of the salt). Stir in the maple-vinegar mixture. Remove the rosemary sprigs and transfer to a serving platter or plates. Eat right away. When the pole bean trellis blew down for the second time, we left it. Granted, we were a bit annoyed at the pole beans. 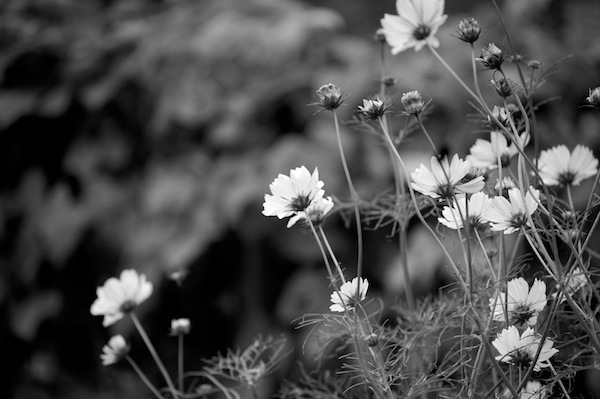 They took a lifetime to germinate and what seemed like eternity to start yielding. Meanwhile the bush beans were churning out lovely filet beans by the pound every day. We would have ignored the pole beans altogether except for this nagging voice I had in my head, “Pole beans are better than bush beans.” I grew up with this voice. My father’s. 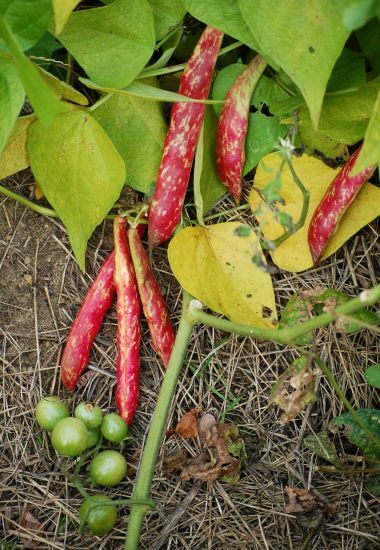 My father and his mother (my grandmother Honey, who “put up” pole beans at the end of every summer) were always carrying on about the superiority of “pole beans” over bush beans. 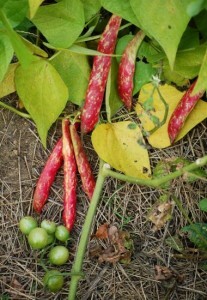 (Pole beans are green bean varieties like Kentucky Wonder that grow on vines as long as 12 feet, therefore needing support in the form of poles or some other trellising.) 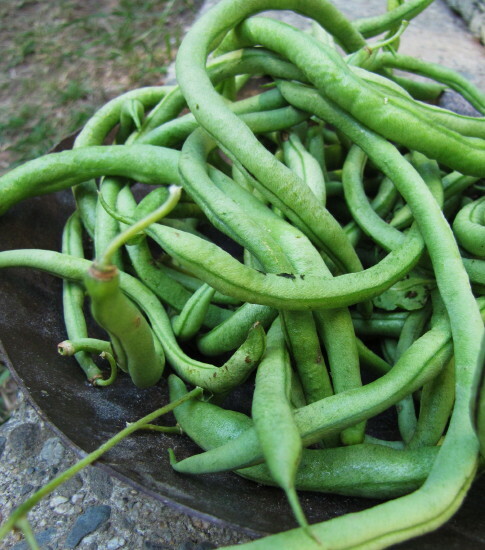 I needed to find out the truth for myself, as it seemed to me that our bush beans (a variety from FedCo called Beananza) were pretty darn tasty—and oh-so-lovely to look at, too. 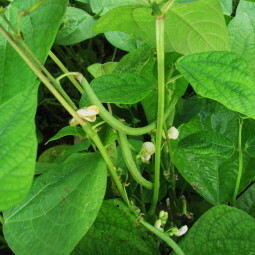 The pole beans looked kind of gnarled up and blotchy the minute they appeared on the scene. 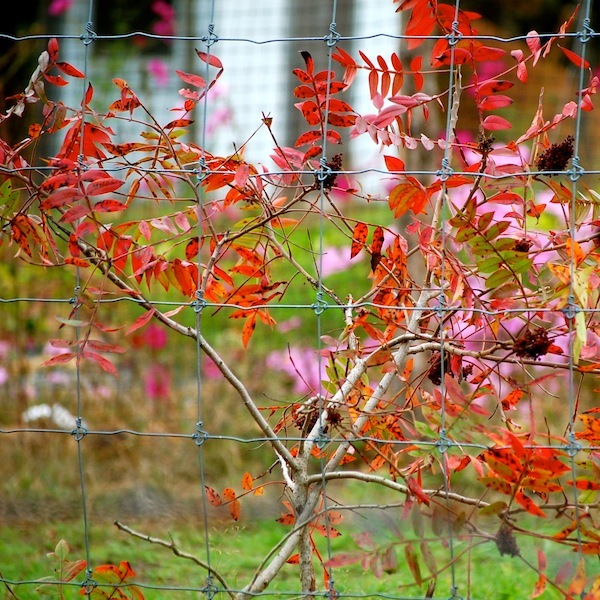 They didn’t get any prettier—but they did keep growing, even under the weight of a collapsed trellis. After neglecting them for a while (figuring we’d eventually till them back into the soil, as nitrate-fixing beans make great soil enhancements), we came along one day, lifted up the vines, and discovered dozens of big funky beans growing under them. We surely weren’t going to sell these fallen beans, so I collected them that day—and every few days thereafter—and took them home for us. From the first time I picked them, I knew something was up. They just smelled “bean-y.” I realize that doesn’t sound too appealing, but I mean it in the best way—a really fresh, green, arresting aroma that followed through when I cooked them. It was green bean flavor times two! Really delicious. So now I have to tell my Dad he was right. Bummer. 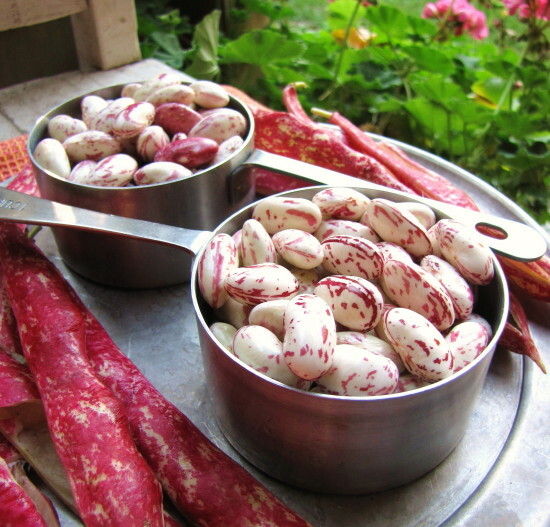 The pole beans (at least the varieties we grew—Kentucky Wonder and Fortex) do present one cooking challenge: their texture is a bit, well… I wouldn’t say tougher exactly, just more substantial, I guess. Toothsome, in a good way. To me that texture is a clue to cook the beans a bit longer and with some heartier flavors. But by longer cooking, I don’t mean boiling them to death. I mean something like slow-sautéing, where the beans get brown and tender and pick up the flavors of other ingredients in the pan, like the shallots and bacon in the recipe below. I made this recipe yesterday because it felt comforting and warm, and we’ve had a bit of a nip in the air up here. Plus, I had some particularly gnarly beans to deal with. So it may not look so pretty (though, yes, everything is supposed to be that brown—brown is where all the flavor is), but it did taste pretty delicious. If you don’t have pole green beans, don’t worry. This recipe will work great with any mature green beans—just choose the largest beans you can find when you’re shopping. This method of “slow-sautéing” involves a crowded pan (the opposite of what you would think of for a quick sauté), but I promise you it works great. Keep the pan at a gentle sizzle—you can always slow browning down by lowering the heat. The end goal is veggies that are cooked through and nicely browned, too. In a small bowl, combine the orange juice and vinegar and set aside. In a 10-inch straight sided skillet, heat the olive oil over medium heat. Add the beans, shallots, bacon, and a scant teaspoon of salt. Using tongs, toss to break up the bacon and to coat everything with the oil and salt. Reduce the heat to medium-low. Cook, stirring occasionally at first and a little more frequently after browning begins, until the vegetables are all very-well browned and limp (the bacon will be cooked through and some pieces will be crisp), about 22 to 25 minutes. Remove the pan from the heat, add the butter and the orange juice mixture, and immediately stir to incorporate the liquids and melting butter into the beans. 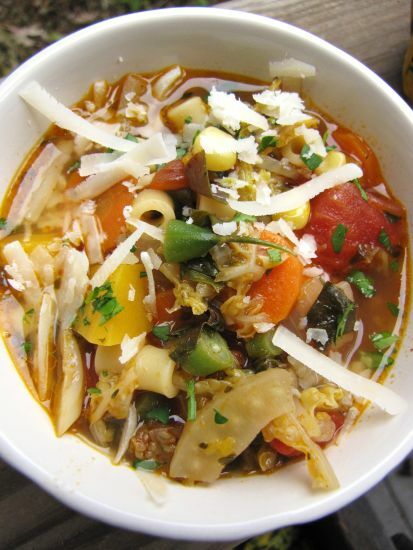 Transfer the vegetables to a serving dish or individual plates and serve hot or warm. It’s About the Green Beans, Stupid! For all the complaining I did about green beans as a child, I can’t believe I’m growing (and eating) more of them these days than practically any other vegetable. My green bean complaints started early. First, my mom seemed stuck on serving those frozen, stringy “frenched” beans about five times a week, no matter what else was on the plate. (‘Very mushy texture’ is the best thing I can say about them.) After her Julia Child-cooking enlightenment period, my mom moved on to fresh beans—but we still ate them, boiled with butter, a lot. Then my Dad got into vegetable gardening, and his pride and joy were pole string beans. 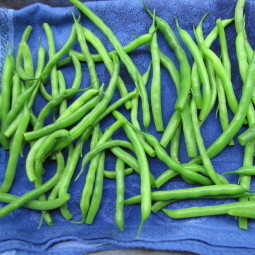 I remember one summer (I think I was 10) when it seemed like we ate nothing but green beans. Ack. I’m pretty sure there was then a period of about 20 years when I didn’t eat any green beans at all. But eventually I became editor of Fine Cooking magazine, and as such, privy to all kinds of reader feedback and issue surveys. I noticed that every time we did a feature with green bean recipes in it, the article topped the popularity scales. Finally, I had to say to myself, “It’s about the green beans, stupid.” Yes, I admitted, green beans are the most popular, most well-liked vegetable on the planet (or at least in America). Fortunately somewhere along the way I also learned to love green beans—mostly because I began to cook them in lots of different ways. (I roast, grill, braise, and sauté them in Fast, Fresh & Green.) But there’s no getting around the fact that boiling is the quickest, simplest, and most efficient method for cooking green beans perfectly. And also the easiest way to ruin them. There’s only one way to tell if a bean is perfectly cooked—by tasting it. Tasting as you cook is one of those concepts that chefs hammer into your head in culinary school, so I just thought I’d pass it along to you without screaming or throwing pots. There really is a practical (and rewarding) reason to taste as you cook. Actually, two reasons: flavor and texture. Unless you taste as you go, you won’t catch the subtle changes in flavor and texture that heat (both dry and wet heat) imparts to food, and you won’t be able to make the necessary adjustments in seasoning and cooking times that recipe instructions simply can’t tell you to do. Green beans are a great example. Undercooked green beans are rubbery; overcooked are mushy. 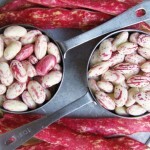 If you are boiling beans, simply begin tasting them after a few minutes. At first you will have a hard time biting through them. 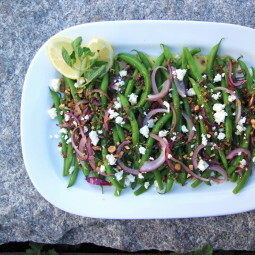 As the texture softens, the green beans are closer to being perfectly cooked. When you can just bite through with no resistance, they’re done. (If you walk away to check your email at this point and come back 5 minutes later, you will be sorry.) Yes, you will have to sacrifice a few green beans to tasting. The thing is, different sized (and different aged) beans cook at different rates, so you pretty much need to taste every batch every time you cook them. 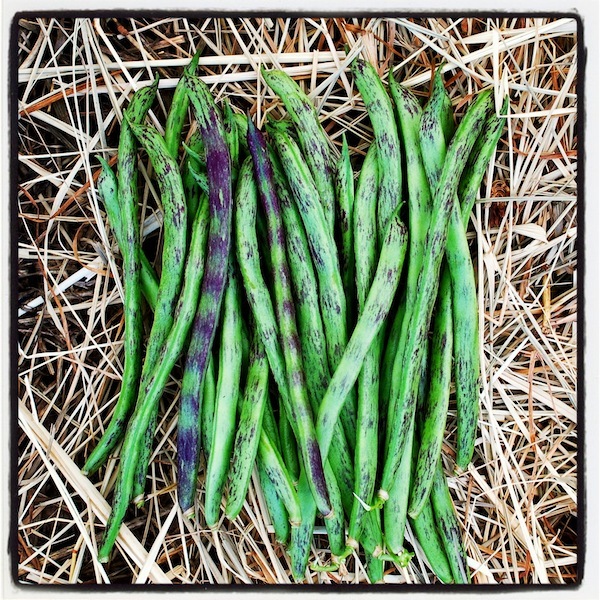 In our garden, we are now harvesting “filet” beans—lovely slender green beans that are similar to French haricots verts—and they cook in just a couple minutes. But yesterday, I bought regular green beans at the grocery store to test a recipe for this blog (below), and they took about 6 minutes to be perfectly done. So tasting’s the thing. 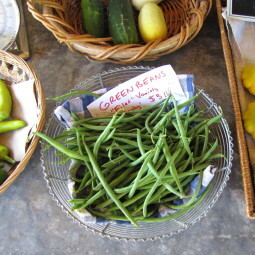 By the way, in case there was any doubt, green beans are just as popular on Martha’s Vineyard as everywhere else. Even on recent days when hardly anything else at the farm stand has sold, the filet beans have disappeared. So of course, what have we gone and done? Planted more. 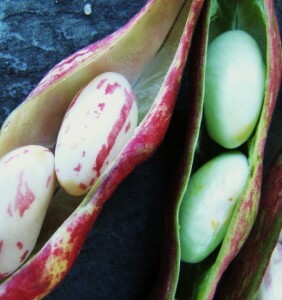 (Bush beans are quick to germinate, flower, and fruit.) 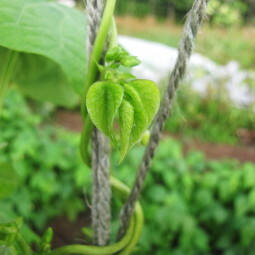 And the pole beans are coming, too. Yikes, I am going to be surrounded by green beans… having Jack-and-The-Beanstalk nightmares, don’t ya know. What goes around comes around. The technique for perfectly cooked green beans is embedded in the recipe below. If you don’t feel like green beans with a Greek flavor profile, simply cook the beans and dress them as you please while they’re still a bit warm. Brown better, lemon oil, pesto, your favorite vinaigrette—whatever you like. In a small nonstick skillet, heat ½ teaspoon of the olive oil over medium-high heat. Add the sliced red onion and cook, stirring, until the onion has just softened (the smallest pieces will be wilted), about 2 minutes. Set the onions aside. 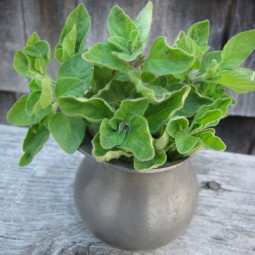 Fill a large saucepan half full with water and 2 teaspoons kosher salt. Arrange a few layers of dishtowels on a work surface to drain the beans. Add the beans to the boiling water and begin timing immediately. Boil until the beans are tender to the bite but still green, 5 to 8 minutes. (Begin tasting after 3 or 4 minutes; depending on the age of the beans and how quickly your stovetop brings water back to a boil, there can be a wide range in doneness times.) Drain the beans, or use tongs to lift them out of the water, and spread them out on the towels to let excess moisture drain and evaporate, about 5 minutes. Make the dressing: Whisk together the 3 tablespoons olive oil, the balsamic vinegar, the lemon zest, the honey, 1/8 teaspoon kosher salt, and several grinds of fresh pepper in a glass measure or small mixing bowl. Add the chopped oregano and the chopped olives and stir or whisk again well to combine. 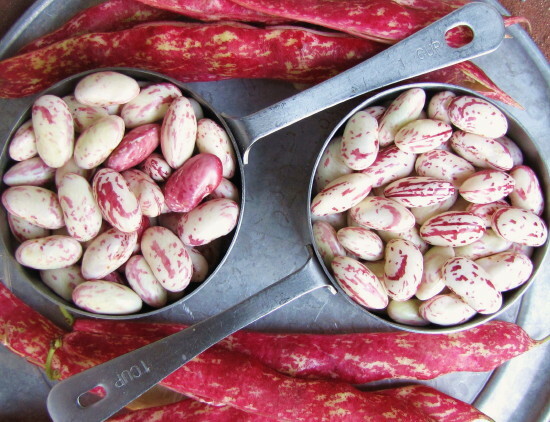 Arrange the cooled beans on a platter or in a shallow bowl and drizzle with all of the dressing. 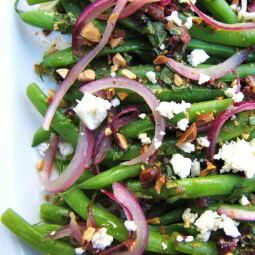 Arrange the red onions loosely over the beans and sprinkle with as much of the feta cheese and toasted almonds that you like. Serve slightly warm or at room temperature.